I know Dorset well but it's a while since I visited the Piddle Valley,(the river really is called the Piddle And, as my friend Lee has noted, it reaches the sea at Poole!) To me, the area no longer has the cut-off feel that I used to rather appreciate. In fact, some areas are now awash with brand new fake thatched cottages. These look nicer than modern styles if you want to build new houses in picturesque old villages, but they become monotonous after a while. Their windows are bigger, their rooms are higher and they're obviously more comfortable and infinitely nicer to live in than the older variety. Fake thatched cottages don't need to be dull. This one is I think a Victorian "estate house" built in a village designed in the early years of the last century. 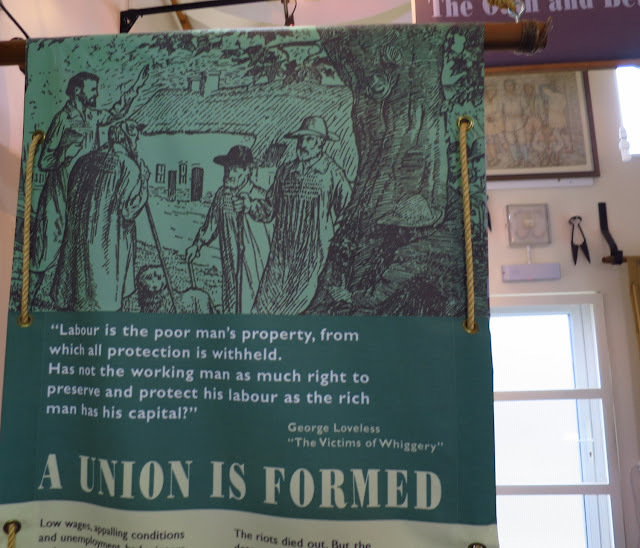 We were staying near the Tolpuddle Martyrs Museum, which commemorates the six farm labourers who began the trade union movement in England. having passed it dozens of times, we finally decided to call in. The Martyrs got into trouble in the 1830s after daring to mention that they couldn't live on wages cut by 40 percent, they were stitched up for crimes they hadn't committed and transported to Australia. 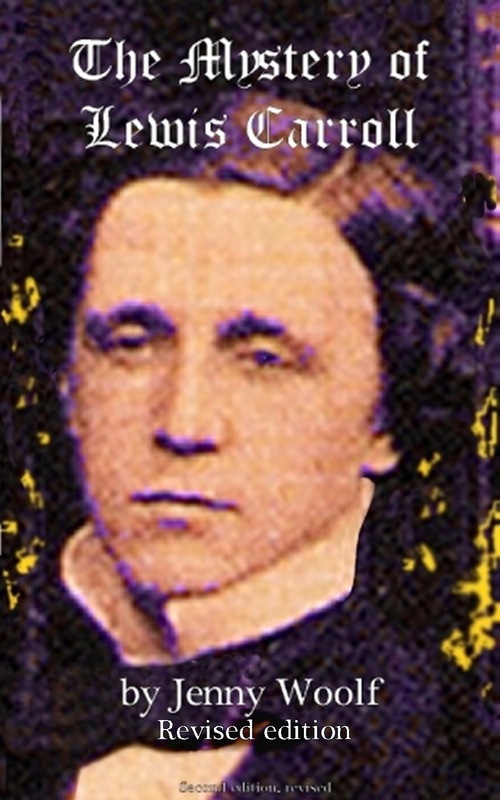 One of them, George Loveless, a most interesting man, wrote a short book telling of the appalling ill treatment which they (and other convicts) endured - it's very interesting. Miraculously all the martyrs survived and came back, but then all except one emigrated to Canada, perhaps understandably. Not sure I'd have wanted to stay in England either.. Much of the exhibition consists of interesting banners. 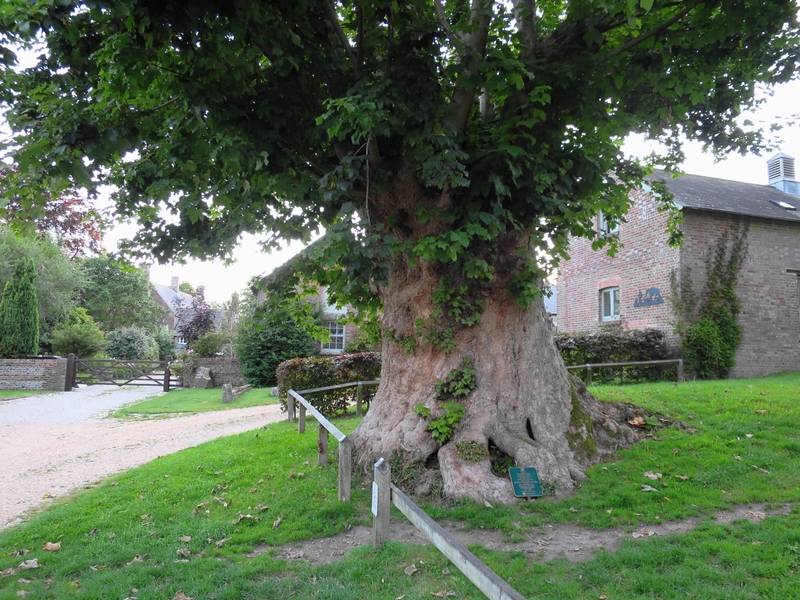 Here you see the martyrs gathering under the ancient sycamore tree that still stands in Tolpuddle. Sadly there was some trouble at t'mill recently when the longtime warden of the museum was thrown out by the Trades Union Congress, which owns the cottages. Perhaps they had a point, but it wasn't the greatest of publicity for them. 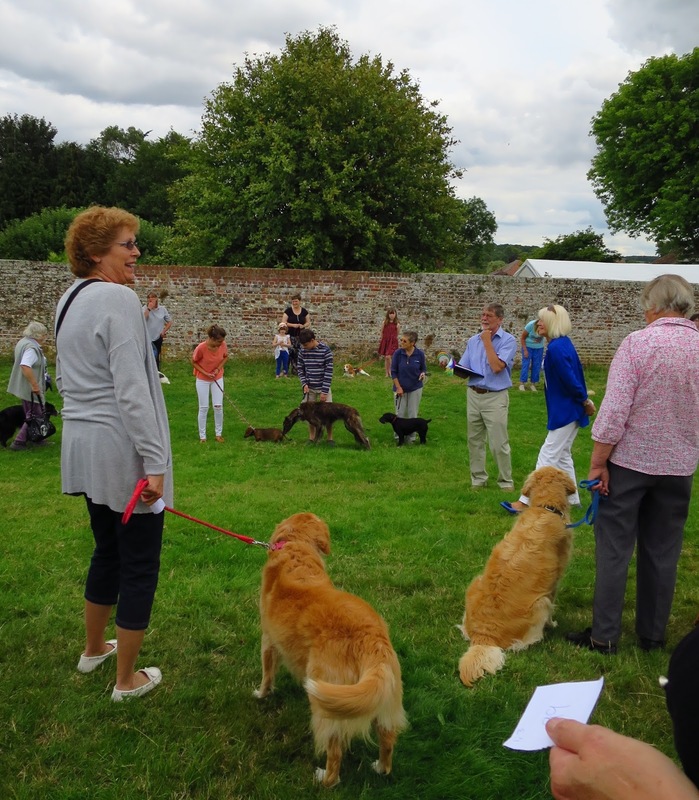 We took the chance to go to a village fete and dog show; events which you rarely find in London. I could spend hours watching dog shows - so much human and canine life. 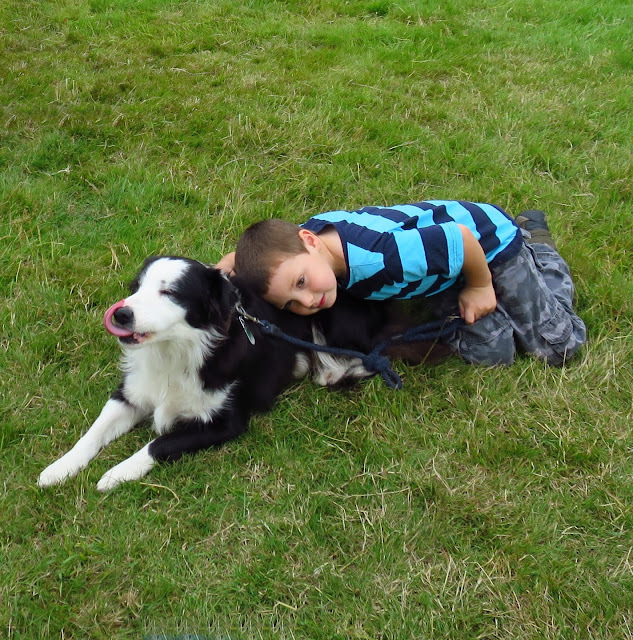 This little boy's pet was, I think, partly blind, a lovely dog which he proudly paraded. This dog would have won my first prize if there had been a class for the dog with the best ears. Noticed some more dogs in the back of a nifty electric vehicle belonging to a modern shepherd. This little truck was jolting over the pastures above Abbotsbury, and the dogs seemed to be enjoying it, although since it was bright and sunny, I much preferred to be outdoors and on foot. The sheep toned so well with the parts of the landscape covered in dry thistles. And I noticed yet another dog off for a canoe ride at Wareham as we made our way to our inlaws at Wimborne, about half an hour away. By coincidence, one of our daughters happened to be at Wimborne and we watched her and our son in law perform at Sting in the Tale, the town's annual festival of stories. 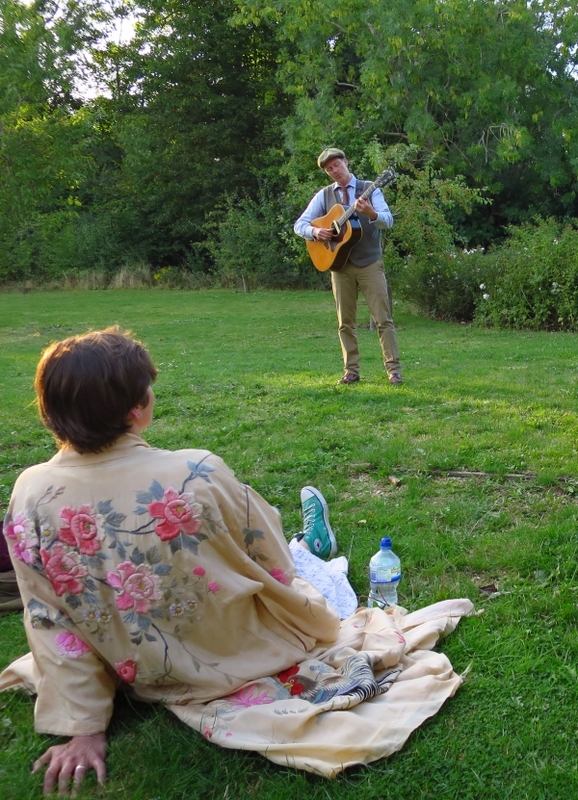 It was a wonderful peaceful evening in a natural performance space in a local park. The late sun lit them like a spotlight, and the audience reacted really well, thoroughly entering into the spirit of the music and words. 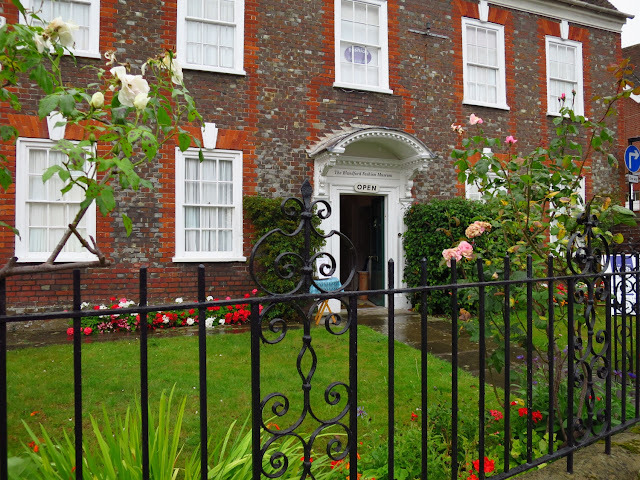 On another day we looked at Blandford Fashion Museum, It's found in a large house from the early 1730s, built not long after a gigantic fire had destroyed much of medieval Blandford. Maintained by volunteers, the museum is really nice. It evolved from a large private collection, and it aims to show how fashion reflects social history. The captions were comprehensive and interestingly written,and my eye was caught by so many details. I noticed, for instance, these long ruched net gloves. 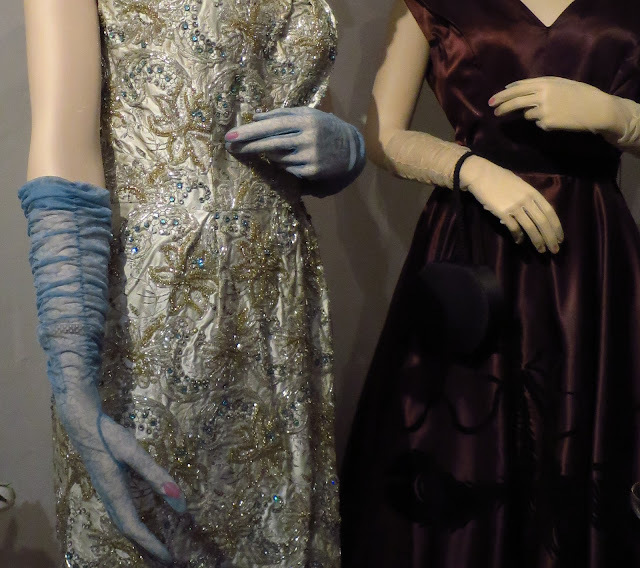 They were worn in the 1950s but, though elegant, they look just a bit creepy to me. I also learned some things I hadn't known before, such as that Victorian brides in mourning wore grey or lilac wedding dresses - and I also discovered how a crinoline is constructed, and how easy it is to catch legs in them if you dare to walk with long, unladylike strides. Apparently there was also a significant risk of being blown off high places in strong winds, but the good news was that often the crinoline would act like a parachute and waft the lady safely to the ground. 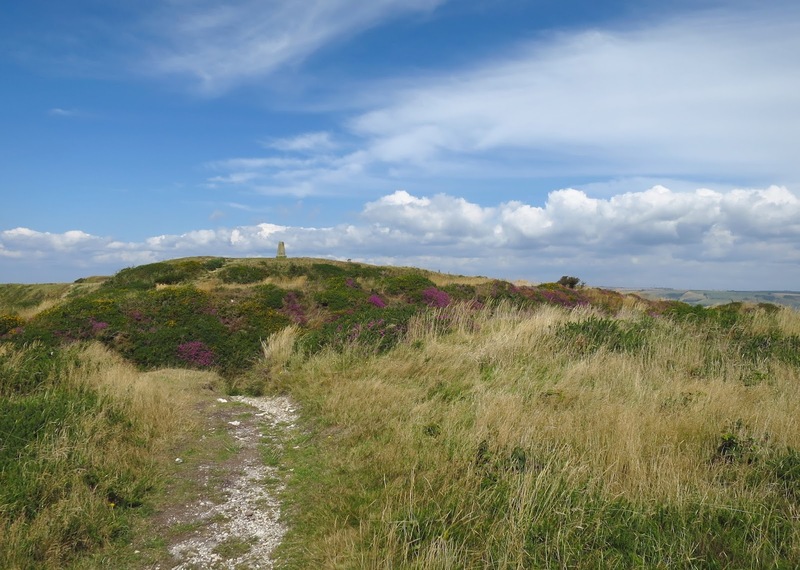 I was glad we had a fair day to visit Durlston, on the Isle of Purbeck, high above the seaside town of Swanage. When I was a teenager I did a holiday job as a warden in Swanage Youth Hostel. I was seriously lazy in those days and as the car laboured up the hill I felt rather ashamed to know that I would never have dragged myself up on foot to take a look around at the time I actually lived there. 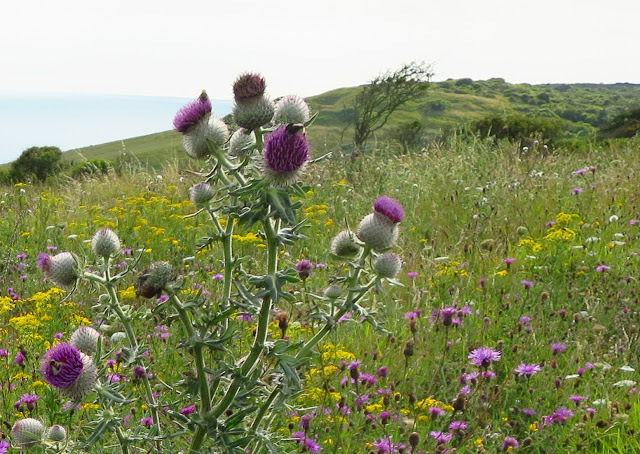 Durlston is now a country park and Site of Special Scientific Interest. 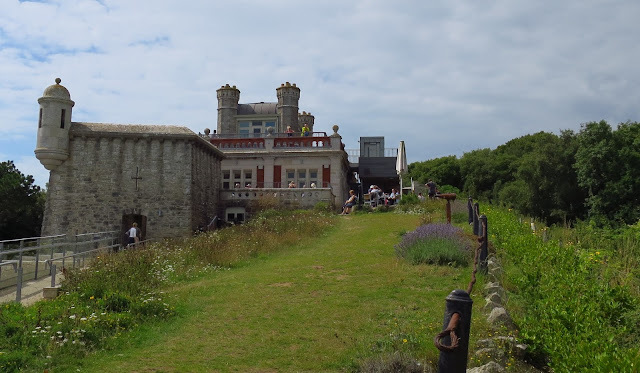 This is the main building on the site - Durlston Castle, consisting mostly of a restaurant and display area. The entire estate was created by a Victorian stonemason called George Burt, who had made a lot of money and wanted to give something back to his home town. Now, the castle has been really well modernised with the aid of a lottery grant and the estate has been restored and is managed as a huge wildlife site. There are useful and ever-changing displays of information about all the plants, birds, animals and insects inside the Castle. Here are some photographs. I really was impressed. As befits a stonemason, George Burt left many carved slabs along the paths and created a big globe of the world as it was in Victorian times. Many of the slabs contain snatches of appropriate poetry, which is rather nice as it helps you see how he saw the place himself. He clearly had a good understanding of human nature, too. Two slabs of stone stand near the globe. 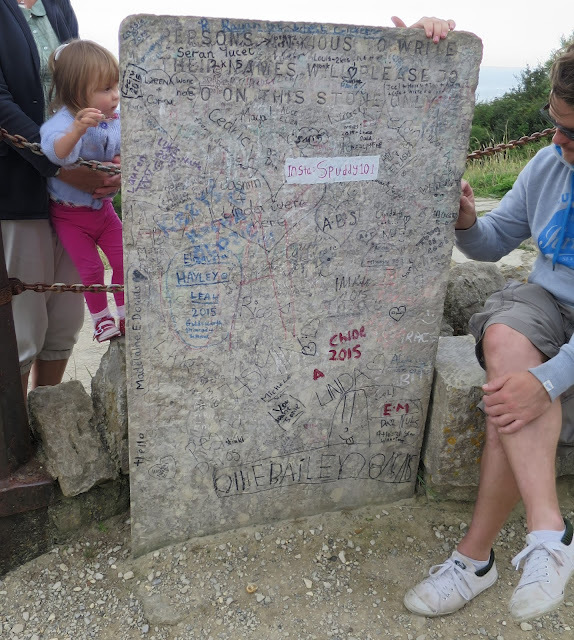 On each is is quaintly written PERSONS ANXIOUS TO WRITE THEIR NAMES WILL PLEASE DO SO ON THIS STONE. And so they have. Here's a picture of one of the stones - and the globe and other inscriptions are free of graffiti. It is is open all year, it's beautiful, you can walk along the coast for miles, and it has a nice restaurant. My friend says it is also a super place to go with dogs. For some reason, though, Durlston doesn't appear in most of the tourist information I picked up in the area. Oh,and one final picture, to prove you can see the Isle of Wight when you sit outside and have your tea. There it is in the distance, although I don't think this little girl was interested! 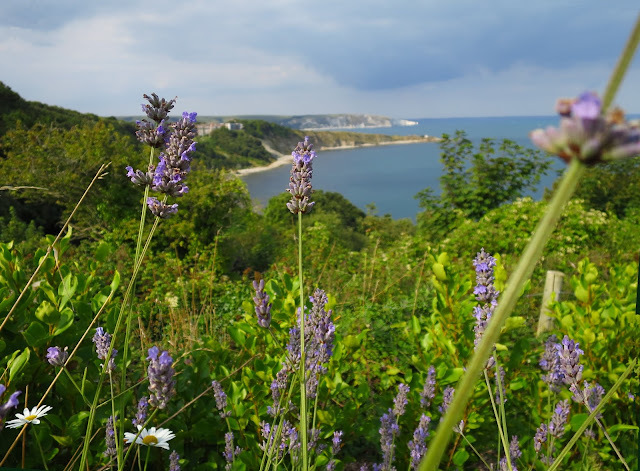 One evening we took a walk on National Trust land a little further up the coast, at Ringstead Bay. The windswept trees below looked oddly like breaking wave and I wished I had seenthe whole scene on a stormy day. So we had a good trip to Dorset, and each day we were glad to come back to our friend's mum's cottage and admire the sunsets. PS. Just to say that Star Men (the film about astronomy) now has a UK distributor, so if you want to see it, write and ask your local cinema to offer it a screening. It's also on at the Cambridge Film Festival on 3 and 4 September. I love the idea of being wafted off a rooftop by the wind in my skirts, and gently deposited on the ground. Sounds delightful! The photo of the sheep in the field is picture-postcard perfect. Lovely photos. Looks a little like Mary Poppins with her umbrella floating along. Look slike you had a great holiday there. I hadn't thought of Mary Poppins! but I still think I might find it pretty scary to be whisked into the air by my skirt! 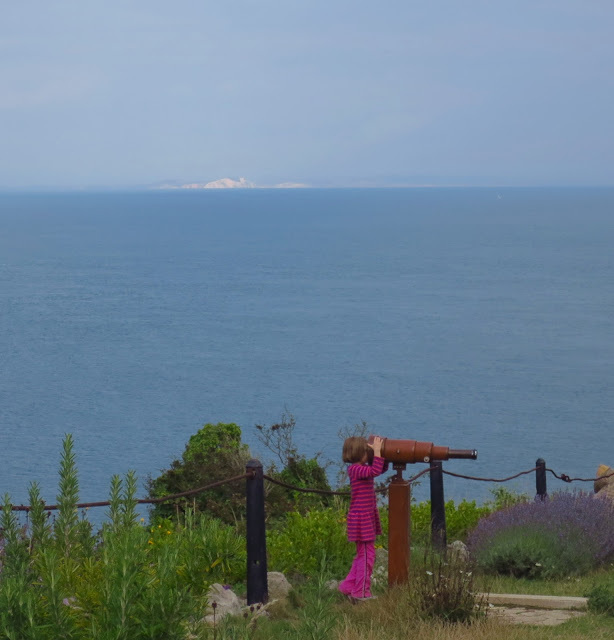 It seems a wonderful holiday, and the little girl sighting the Isle of Wight is precious. I took a look through those modern "thatched" cottages, and see I could live in any one of them. I know, and you might definitely find you didn't really want to live in one of the original ones! they were originally very much designed for poor people.... although they have a wonderful charm if they are looked after well. The gloves look more than a little creepy to me and I don't remember anyone wearing them in the fifties. The crinoline parachutes look like something out of Alice in Wonderland. A fascinating read as usual though. Lovely! I so enjoyed your photos and description of the area! Someday I will visit the UK, Wales, Ireland & Scotland. What a wonderful place to visit. As always, you've given us a fascinating post with great photos. I like the thatched cottages a lot and wouldn't even mind living in a fake one. Even thought I'm a confirmed cat person, I love to watch dog shows and never miss one when they're on TV. I can only imagine what it would have been like for a woman to wear a crinoline dress in windy West Texas. There would be ladies flying all over the place (just like in that illustration). I'm glad you enjoyed a nice holiday. I was glad to see all your pictures of it! Yes, the fake ones are a good compromise, because after a while they blend in more. I think perhaps in 100 years time when people have had a chance to make alterations and the gardens have grown up, they will blend in even better. Your posts always teach me something and fascinate me, and i'm hoping all is well with you. Being at a local dog show looks like a very fun outing! Yes, all is well. And I definitely recommend dog shows, even if you are not much of a dog lover. It's the little scenes that are played out all over the place among the spectators (and their dogs) that are so fun to watch. Thanks for this tour of an interesting place. Loved the pictures. Oh Jenny, what a wonderful post, filled with such beautiful photos (oh, those flowers!) and the wonderful details I love about an area I would like to discover. How perfect to travel vicariously through your words and pictures. It sounds like the most wonderful "fallow" time. Maybe the writing time was fallow, but not the travel, the relaxation, the fun. That was most evident! Thanks for sharing such interesting details. So many things I'd enjoy here. But mostly, the sheer beauty. Thank you so much, Jeanie! I agree that fallow time does not mean wasted time, but in our busy lives it is easy to forget that truth. Another very interesting post filled with wonderful, beautiful photos, Jenny. I love that great old tree...I bet the dogs do, too! What a wonderful post and I love all the beautiful photos. But... my heart belongs to the proud little boy with his half blind dog. What a sweet pair. The darling dog with the great ears and then the crinoline parachute ladies next. Your post had a bit of everything ! I loved the little boy too. He was so devoted to the dog. It seemed quite an old dog, and had one eye that looked blue, which is why I thought it might be blind. 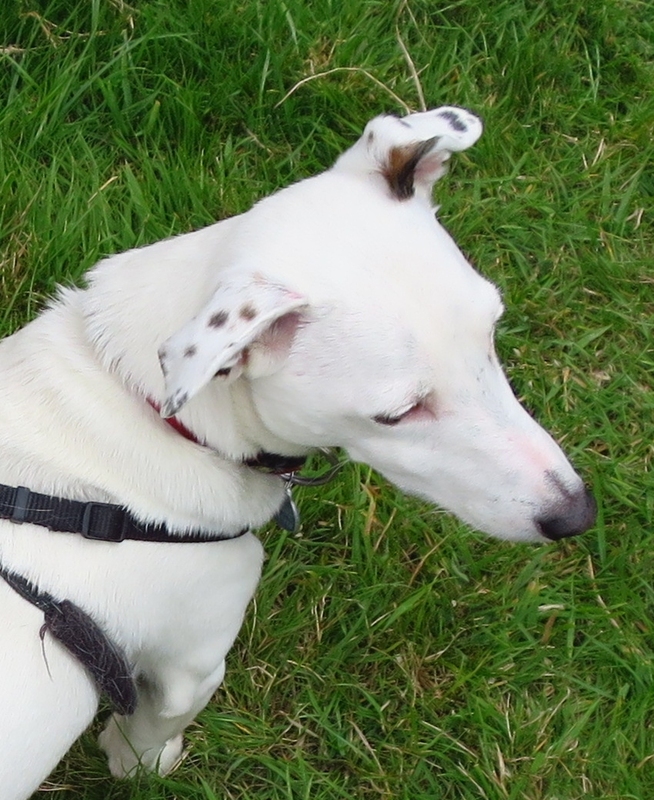 Those spotty ears were quite unusual, weren't they? I love this post, Jenny: so many wonderful sights for us to see. Dorset looks wonderful. I have just finished re-reading Far from the Madding Crowd, having seen the new movie, so I love the sheep picture best of all, beautiful. Seems there are two famous Thomas Hardys... I didn't know of Sir Thomas, but now I do. Remembering hearing about the Tolpuddle Matyrs at school, but needed reminding of these special souls. Blue net gloves are definitely a bit creepy. I think it's the colour. 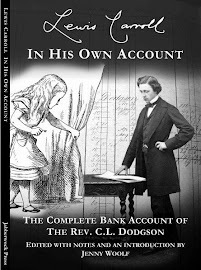 PS I have downloaded your Mystery of Lewis Carroll to Kindle - don't know what took me so long :) I look forward to enjoying it. This was a lovely collection of photos and information, Jenny, thank you! The Fashion Museum and Durlston look very much like the kind of place I enjoy visiting. You are right about the modern "fake" cottages; they fit in better than something made of steel and glass, but tend to become monotonous when there are too many of them in one place. Yes, Meike, I think you would like those places. If you ever get to them, I'd be interested to read what you think. And as for the cottages, after a while they stand out like a sore thumb. Still, they do look better than the usual little modern boxes. That tree where the "union" met gives me shivers -imagine how old it is and what stories it has witnessed. The awesome views you've shared are fantastic. It was fun with dogs meeting too. Yes, sycamores are wonderful trees, although it is surprising how rarely you see them grown to full size. I suppose it's because their saplings get all over the place and people pull them up. And yes, I know what you mean about the shivers. It is remarkable to think of how Tolpuddle must have changed in that time. It's quite comfortable and middle class now but the poverty then was absolutely appalling. 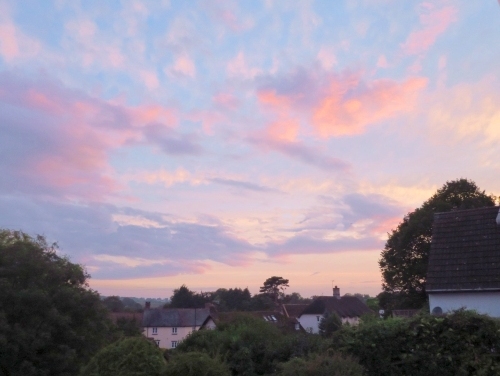 I love Dorset and recently stayed in Corfe. Unbeknownst to us, there was a battle reenactment going on that weekend so we shared the village with hundreds of Vikings and Saxons! A very interesting post, Jenny. Sadly and regretfully I never made it to that part of the world. Now I know what I missed. 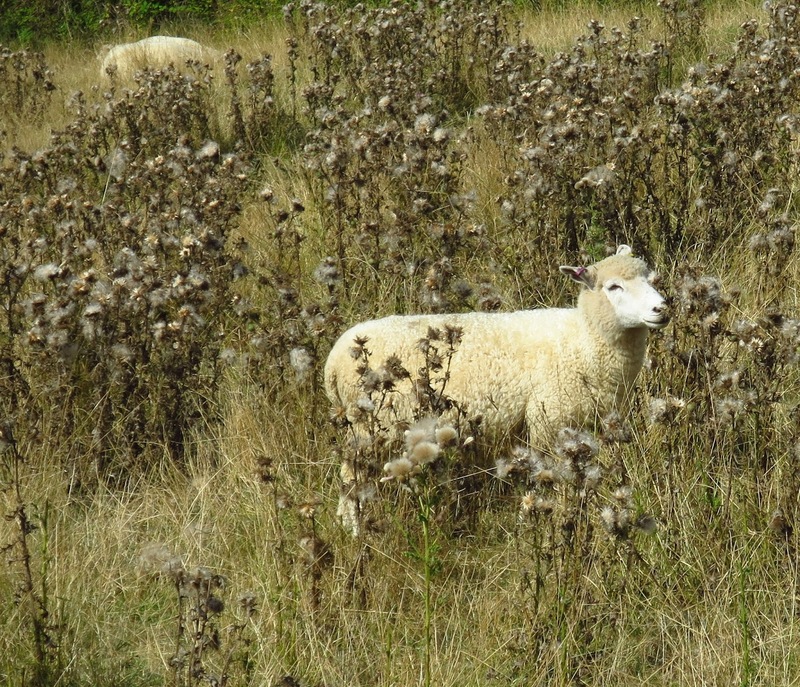 I really liked the picture of the sheep amongst the thistles. Yes, it really looked as if the sheep had been designed specially to blend with the landscape! Doreset is such a lovely county, I didn't see any of the coastal area when I was there Wimborne is the only place that you mention that I visited. Love the dog photos especially the boy with his blind friend. George Burt sounds my kind of man:) What a great idea to leave a stone for people to carve their names on - it's obviously worked as intended too! Yes, I thought he must have been an interesting person but I couldn't find much information about him.Strange really since they owed the site to him in the first place! It is so nice to see you back on Blogger and sharing your adventures with us. You visited such lovely and interesting places and I appreciate you sharing them with us. Good to see you back, Jenny. Am I right in remembering a large stone globe in Swanage, on the headland? Don't worry about the blue-eyed collie dog. It's not too rare for collies to have one blue eye, one brown, and it doesn't seem to affect their vision - they can certainly still see sheep. What a gorgeous post with lot's of beautiful photos. The photo of the little boy and his dog makes me smile. Actually, a part of me is a very nostalgic person. I am drawn to Victorian style very much. So beautiful and elegant! Took a walk along the Piddle one time, a name that still sticks in my memory, love your photos. I too am glad that you are back!!! You have some lovely friends, mine mostly pop over to mooch a drink or two. Well ok, I offer but I have never had one offer me a cottage to visit. I need new friends. Glad you had such a good time - from Tolpuddle to dogs and beyond. And I agree - Dorset is lovely. How I have missed your tours! Great pictures and great dogs also. Thank you! I hope to post more often now! a dress when i go up in the mountains in case I fall off eH? ha. Ah, another of our old haunts from our twenty-five years living in nearby Wiltshire. I knew many of the places but not all the attractions. I have happy memories of Durlston too. Lovely pictures. I'm glad you remember Durlston fondly. I was told that it had become rather derelict for a while and that made me sad but clearly it was not like that when you were there, and certainly isn't like that now! a most immaculate place. OH thank you for this lovely post, I feel as though I just made a little trip! Stunning place! Interesting to read about the Tolpuddle Martyrs. 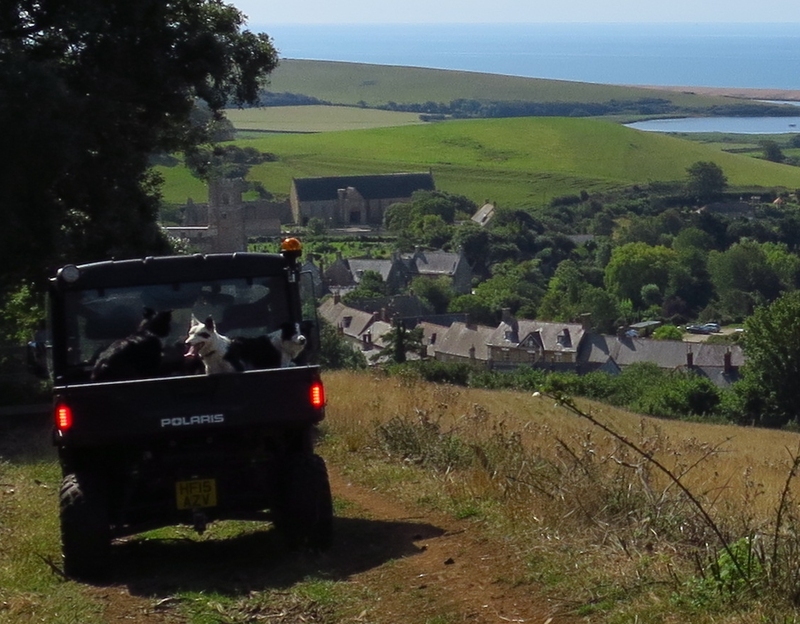 You certainly found plenty to do in Dorset! We stayed in a B&B overlooking Ringstead Bay a few years ago - gorgeous (but very windy) - I remember doing a blog post about it. Ah Jenny, I lived in Dorset for much of my youth. I was at school in Lyme Regis and at university in Bournmouth, so all these spots are much loved old stamping ground for me. I just loved Dorset, and think I have never stopped looking for it elsewhere. The Piddles and Puddles are wonderful names aren't they? The Hardy monument is in the area of one of my favourite walks along the Ridgeway, but I didn't know about the fashion museum. My father's family come from the Wimbourne area, and I think there are still Poores around there, but I'm not sure. Thank you for bringing back so many wonderful memories. I'm sorry about all the new housing, but I suppose it's more or less in keeping. I always used to like Dorest's sense of being the forgotten county, but maybe that's not the case anymore. A wonderful post. Thank you again! Thank you Val, what a nice comment and so interesting. I studied in bournemouth too,are you thinking about the campus at Lansdowne? What a nice comment, Val, and I am glad that my post brought back memories. I always love reading other peoples' posts about places I knew. I went to college at Bournemouth too! 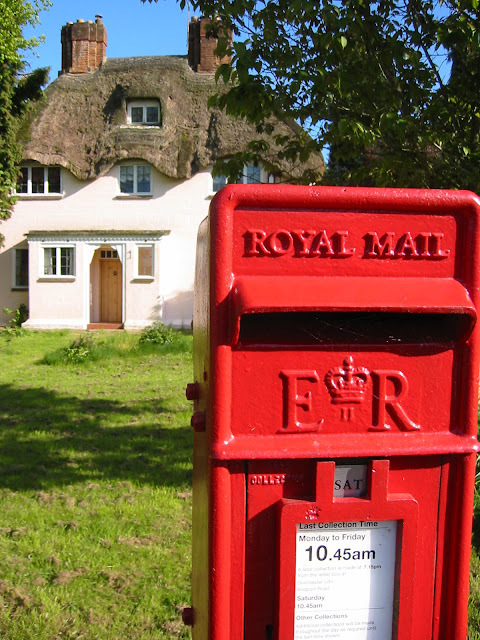 a long time ago :) I will look out for Poores next time I go to Wimborne. Sometimes an unexpected trip can be better than one long planned. It looks as if you had a really lovely holiday, and also you have returned home with some lovely photos too. 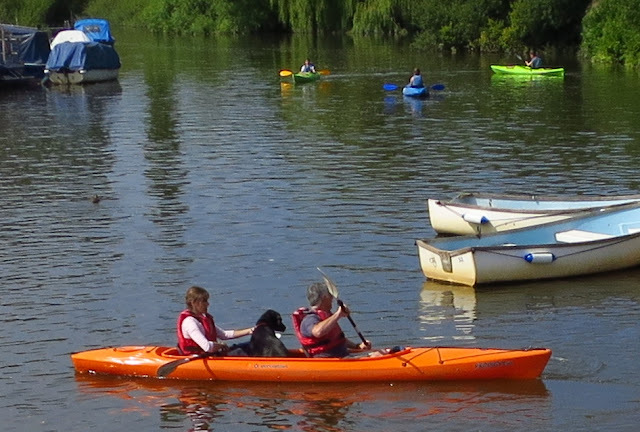 I always enjoy watching people with their dogs, we don't have one because we travel too much, but as I get older I can see what a great pleasure people do get from them. I am sure you are right not having one though. They get so upset if they are left behind. We looked after a friends dog at the weekend, we knew her well and so she was happy but even so she was bothered that her owner was not there. Luckily she got over it in time but it was a great relief for her nonetheless when her owner got back. Next door to us the people keep a little dog and leave it alone all day. It's pathetic to see it standing at the window barking hopefully at other dogs. Not fair. That's a coincidence, Jenny. We were in Dorset the other week - I have family roots there - and had lunch at the inn in Tolpuddle. Didn't make it to the museum - though I did stack up some good material for the blog, as you can imagine. Loved your shots, and a narrative that reflected a relaxing, comforting, time! As I said on your blog, a bit of a coincidence all round! Looks like you had a pleasant time at Dorset. The hill dotted with wild flowers where the house of your friend’s late mother is located is beautiful. It’s a blessing to finish your day with such lovely sunset sky after having a lot of fun. 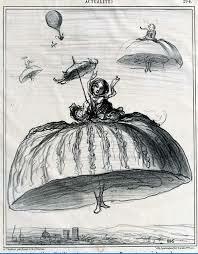 The talk of crinoline parachute is so imaginative. Take care and have happy days ahead, Jenny. I love your photos. I am reminded that there was so much of England I didn't see as a young teen...What a wonderful thing to see now...Crinoline made me think of a dress I had as a very little kid which I found so itchy and bothersome that I literally ripped it up attempting to get it off. Shocked my Nana, which wasn't easy to do. Glad you are well. Thank you, e. I think a lot of Victorian children must have loathed their clothes. I have read a lot of memoirs of little boys who hated eton collars and scratchy jackets but fewer girls who hated the crippling corsets, etc. Perhaps they were brainwashed! I don't know Dorset at all, except for Weymouth, so that was an interesting little tour of the places and sights. That fake thatched cottage does look rather fake, doesn't it? It's far too large for a start. I think the blue net gloves are lovely, and not at all creepy! How on earth did women manage to wear crinolines? They look so preposterously impractical. How exactly would you sit down in one, I wonder? Or did they only wear them standing up? I have never worn a crinoline myself but I admit some of those questions have occurred to me, also how did they use the loo? Absolutely ghastly. I think I would have been part of the Victorian dress reform movement! I think they were more flexible than they looked though as the hoops moved around, a bit as if you were wearing a lot of hoops connected with whalebone, some would move up and some down, I guess. Honestly !!!!!! Good grief, I just read this in Wikipedia: "Crinoline fires alone caused the death of thousands of women in the mid-19th century." Thousands!!! erk! I should think some of them tripped up and broke their necks too. Some of the other Victorian fashions were even worse. Ugh! I'm just trying to catch up with your blog posts and all your amazing photos. Sorry I've been on holiday so have got a little behind with all my blog reading.